Australian Sea Lions Venture Out Of the Ocean To Laze in the Sun. aww they are having a nice and relaxing time there..beautiful shot! Nice shot, Milli. They look like they've picked the perfect beach to sun bathe! this is way too cool. nice shot. Thanks Z. Photo Taken on an island bay beach facing the Great Southern Ocean. These little and some not so little sea-lions are protected here. We are not allowed to venture too close to them. probably because the big ones will kill you, huh? What an awesome shot Milli! They look so cute chilling out on the beach :-). how peaceful they look, a happy photo Milli! oooh look at the seals!!!! what a great shot!!! Makes me want to go out and bask in the sun. A nice entry for the theme. how sweet.... I love these creatures.... love the photo too! I would love to visit Australia someday and see all their magnificent creatures. These ones remind me of beach going tourists around here, happy to lay for hours in the sun with little energy for much else. I love the outcropping of rocks with the puffs of greenery in the background. Very pretty. this is a really great photo Milli!!! Can feel the ocean like I am there! Feels kinda dramatic to me too. Is this near you??? Love this and want to go there.Thanks for dropping by and so nice to see you again on multiply after a long long time! 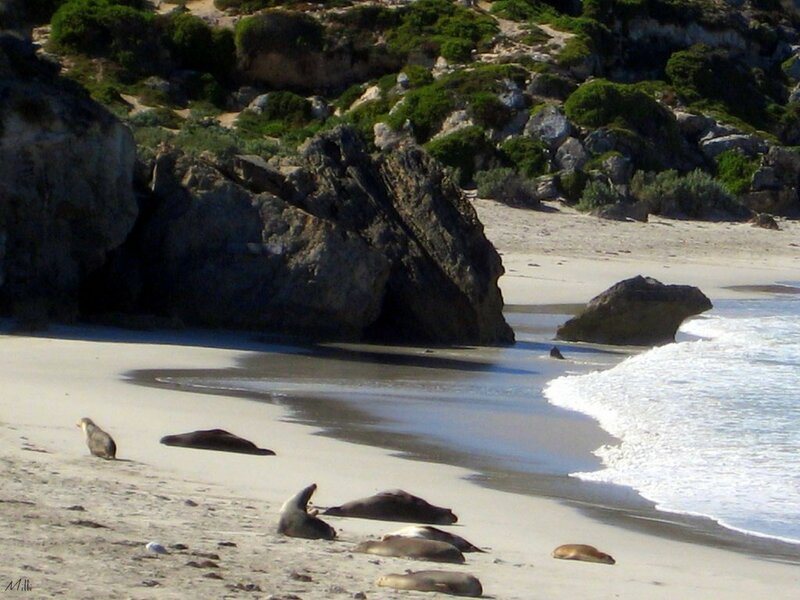 Wow , Milli, Ive never seen seals at Adelaide, where did you take this photo? How close did you get? Love it! Very cute Milli, hope you did some sun soaking too lol! so cute!!! we don't have seals here in our country... not naturally... we only sea them in zoos and ocean parks. Would love to see these for myself!!! I am leaving a Link to the beautiful KI and in particular seal Bay where I was able to view these beautiful creatures with ease. They are actually quite big and have very sharp teeth. lol. Aww they look so sweet and adorable! awesome! don't see anything like that around here. beautiful setting too. Great shot of the sunbathers! Thanks for the visit to mine. This is a neat scene, wish I could be them basking in the sun on warm sand! Thanks for coming over! this is awesome! thank you for the visit, milli. beautiful shot! makes me wanna be there! JUst lovely .. I could just sit and watch them, thanks for your visit! AWWWW relaxing in the sun , how niceeeeeee. We have hundreds of these eating our Salmon. Love the way they are laying on the beach. I think this is an excellent choice for the theme. You didn't suffer for nothing, Milli... this is beautiful!! wonderful way to spend the day without a care in the world! and photograph those guys. I love it! Love it! Dying to be there, chilling out with them though! I want to join them lol it's so cold here for June !!! Beautiful photo !!! Interesting rock formations, too. The entire photo is definitely "of the ocean", including the sand. *looks on the floor*..... Got a cat here whaled exactly the same way lolol. Without the wonderful view... amazing shot! Ty for your sweet comment on my entry this week! They are so cute. Nice shot!